Back in the mid-1980s, I discovered this Heavy Metal "illustrated story" in a clearance bin at a small book store in Boston. It was in that bin with a stack of about a hundred other copies, each selling for just a dollar. I picked one up (I should have picked up ten...) and have kept my copy in my book collection ever since. 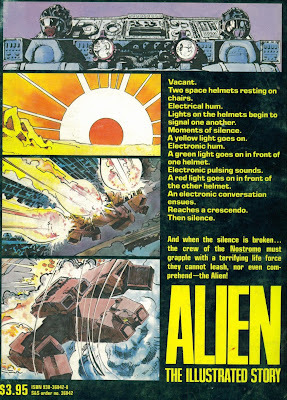 Heavy Metal's Alien: The Illustrated Story by Archie Goodwin and Walter Simonson was distributed by Simon and Schuster, and it's a graphic (and I mean GRAPHIC) re-telling of the landmark 1979 horror film...down to all the chest-bursting, gory details. Character likenesses are good; and even the "tech" (of the Nostromo, Narcissus and the Derelict) exhibits a tremendous fidelity to the movie's production design. 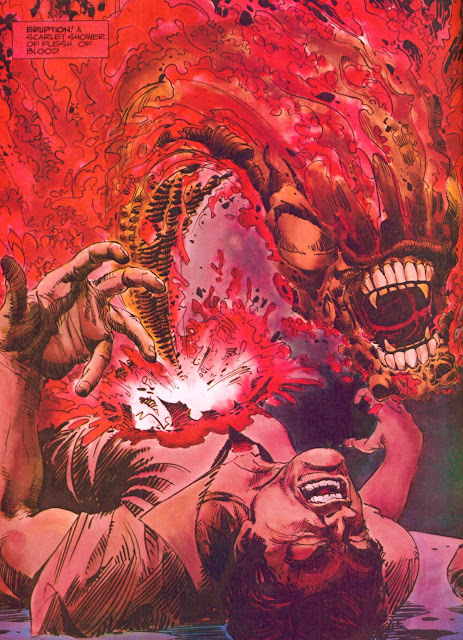 The comic-book adaptation opens with a quote from Joseph Conrad's Heart of Darkness, "We live as we dream - alone," and then launches into the story of the Nostromo's encounter with a hostile life-form. The comic follows the details of the theatrical release very closely. For example, it doesn't feature the famous deleted scene with Dallas's transformation into Alien Egg. There is, however, some alternate/new dialogue in the Narcissus coda, particularly Ripley's conversation with Jones: "Funny Jones, you what I think I'll miss the most? 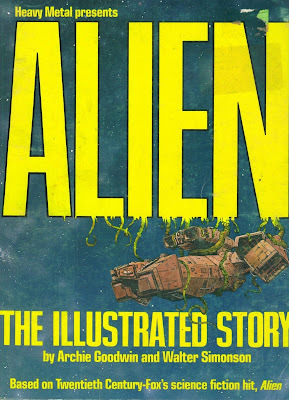 The smell of Kane's coffee when I first wake up..."
Alien: The Illustrated Story originally sold for $3.95, and it's a pretty sturdy book. Hell, it's held up well for thirty years now (about half as long as Ripley's hyper-sleep journey back to Gateway Station...)! I still haul my copy out every now and then to admire the gonzo, blood-soaked, highly-detailed art work. I thought it would be fun to share a little of that gruesome good stuff today, especially as Alien celebrates a thirty-fifth anniversary this year. Just gazing at this books with the drawings of the Space Jockey and the alien itself, I'm reminded of how Ridley Scott, H.R. Giger, Sigourney Weaver and Dan O'Bannon pushed the frontiers of space horror in a frightening new direction here. The haunted house in space concept had been seen before Alien on several occasions, but never with such visual aplomb and naturalism. I still remember talking to friends and family members about the film, and in particular the harrowing chest-bursting sequence. Today, we know it's coming, and we sort of take it for granted. But back then, it had people puking in the aisles.